Patriote leader, Robert Nelson, lead the first attack in the renewed war on colonial Canada. After a summer of planning, collecting weapons, and setting up cells of supporters on both sides of the border, Nelson began his assault on Lower Canada (Quebec) on November 3. It didn’t go well for the Patriotes. Nelson intended to simultaneously attack seven towns and villages along the south shore of the St. Lawrence River as a prelude to an assault on Montreal and Quebec City. Nelson assumed his cells of Patriotes would also rise up inside each town to assist the rebel army. What Nelson may not have known at the time was how well the British had prepared for renewed rebellion. After Nelson's earlier uprising, the British had boosted their force of regulars in Lower Canada to 5000, in addition to many companies of well-armed militia. At least 3,000 rebels (mostly Canadians with a few American sympathizers) assembled in various locations to wage war but found themselves without adequate weapons. A scramble began to get arms. On November 4, 200 Patriotes attempted a sneak attack on the Mohawk reserve at Kahnawake to steal their weapons. Alerted by a Mohawk woman searching for her cow that morning, the warriors drove the rebels away, and captured 60 to 70 of them, which they promptly handed over to the British. About 100 men set off from Napierville for Rouse’s Point about 15 miles south just inside the New York border to fetch a cache of weapons. On passing through the village of Lacolle November 6, they met and defeated a band of militia. Once in the US, they learned the American military had confiscated the weapons. When the 100 returned to Lower Canada, they met quick defeat at the hands of well-armed Canadian militia and British regulars. After sitting for days, Nelson and another senior rebel officer, Charles Hindenlang, lead an army from Napierville to secure the border region and re-establish contact with supplies and men in the US. 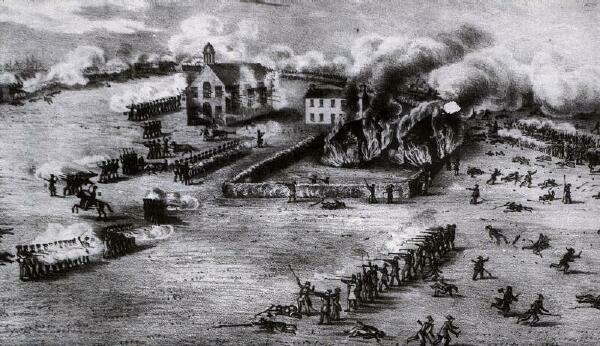 They met a force of British regulars and militia at Odelltown, just north of Lake Champlain, on November 9. After a two-hour pitched battle, the rebels retreated. Nelson escaped to the US. Hindenlang was captured. He was tried and hanged. The last battle of the Lower Canada rebellion took place at Beauharnois, a town on the south shore of the St. Lawrence River near the confluence of the Ottawa River. Earlier that week, Patriotes under command of François Chevalier de Lorimier scored a minor victory when they occupied the town and captured a steamer. The townsfolk rose up in support of the rebels and won the first skirmish. On November 10, a superior British force attacked and routed the rebels. They captured de Lorimier. He was tried and hanged. With the Patriote defeat, the British began a series of brutal reprisals against rebel sympathizers. In Beauharnois, they burned much of the village and any local farm where no men were at home, based on the assumption that the men’s absence meant they had joined the rebels. In his memoirs of the Patriot War, Benjamin Wait recalled steaming past Beauharnois on a prison ship while barn’s burned and the town's ruins smoldered along the shore. At an extended court martial in Montreal, the British tried 108 captured Patriotes for murder and treason in late 1838 and early 1839.